We Don’t have a Retirement Crisis. We Have a Young People Crisis. This is median net worth, and it’s practically zero for young households. 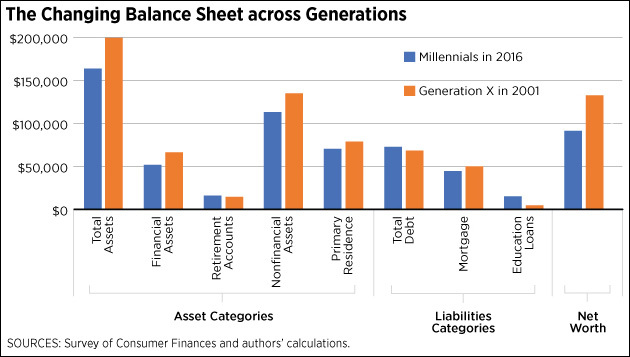 That’s not really a surprise: people tend to take on lots of debt when they’re young and they haven’t had the time or the income to build up much in the way of assets. The real problem is that it’s gone down from $15,000 to $11,000 over the past 25 years. Conversely, the median net worth of retirees has gone up from $145,000 to $224,000. That’s a 17 percent drop vs. a 55 percent gain. This is one among many reasons that I keep harping on the proposition that liberals should stop obsessing over the “retirement crisis.” There are two very specific problems with retirement, and those are worth addressing.² But as a general proposition, there just isn’t a retirement crisis. You can calculate it any way you want, but unless you torture the data into a pretzel, most retirees today are pretty well off. Their 401(k)s don’t allow them to live on yachts, but old-school private pensions didn’t either. So retirees are basically fine, and will probably be more than fine in the future. It’s younger generations that are in trouble and that’s who we should be laser-focused on. The reason for obsessing over retirees, I think, is that our two big retiree programs are Democratic creations and liberals are proud of them. They’re also pretty easy to identify and improve. But that’s like looking for your lost keys where the light is good. It’s not nearly as easy to identify concrete ways to help young families, so we tend to mumble and tap dance around them. That’s lousy policy and lousy politics. It might be harder, but we should be looking at ways to help young families with at least the same intensity that we bring to Social Security and Medicare. Instead of allowing kids to stay on their parents’ health policies until age 26, how about just offering them free Medicare until they’re 30?³ Not everyone has parents with health insurance, after all. Free public college of all kinds is a good idea too, even though it’s difficult since this stuff is all done at the state level. But if we do it, our main focus should be on trade schools and community college, not 4-year universities. Or how about a rent subsidy? Maybe the feds offer to pay a percentage of your rent: say, 20 percent at age 20 sliding down to zero at age 30? Or an income subsidy that works the same way? I’m just tossing stuff out here. They might be bad ideas. But if we want to help the people who really need help, we should focus on non-college-educated young people. They’re the real forgotten demographic. They’re also the ones who we badger about not voting. So let’s give them a reason to vote. ¹In case you’re interested, it’s Table 4 in the 2016-dollars version of the Public Data spreadsheet. ²The first problem is the meager income of the lower third of retirees who depend solely on Social Security. Their benefits should be increased by about a third. The second is long-term nursing care. A one-year stay in a nursing home—which is not uncommon—can easily wipe out the retirement savings of a middle-class family. This should be covered by Medicare. ³This is also a not-especially-sneaky way of moving in the direction of Medicare for all.